HWMO had the honor on October 31 to share about its Firewise Communities successes (and challenges) at the national Firewise Workshop hosted by the National Fire Protection Association in Boise, Idaho. Community Outreach Coordinator for HWMO, Pablo Beimler, presented on the importance of laying the foundations for community-wide grassroots and sustained actions towards becoming a Firewise Community. This requires building autonomy, pride, inspiration, and enthusiasm in community members, along with agency and governmental support. 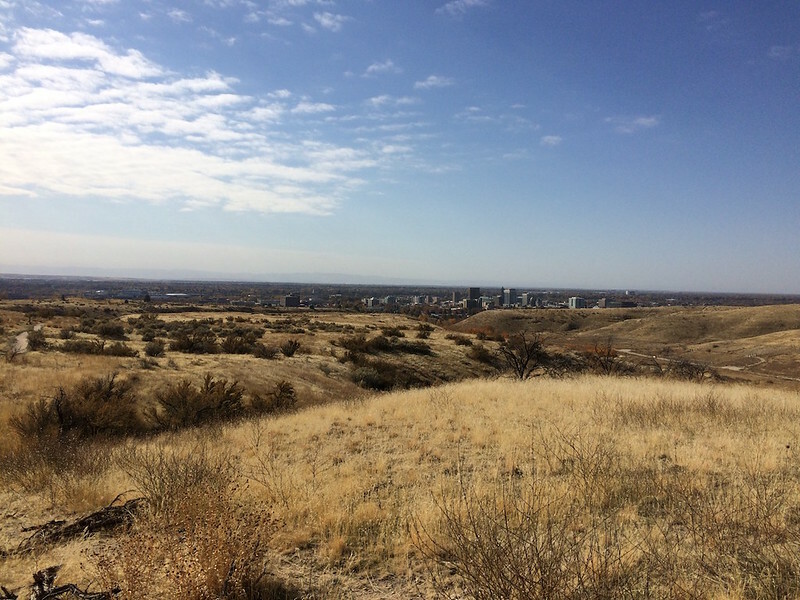 View of Boise from the foothills near the city. Hawaii was well-represented at the workshop that was held at the Grove Hotel. Representatives from Honolulu Fire Department and DLNR Division of Forestry were there with HWMO, thanks to funding support NFPA. We were informed about updates relating to Firewise and joined interesting group discussions regarding the future of wildfire risk reduction work in the U.S.
As an added bonus, with our friends from HFD and DOFAW, we took part in a two-day training on assessing the Home Ignition Zone (HIZ). The training was taught by two extremely knowledgeable wildland fire experts: Jack Cohen, who many consider being a father of modern wildfire mitigation theory and practices, and Pat Durland, who has 30 years of experience as a wildland firefighter and mitigation specialist. Together, they gave engaging lessons on fire ecology and science, the sociology behind assessing homes, and more. On the final day of the training, we hopped on the bus with the other training participants, who hailed from across the U.S., and practiced assessing home ignition zones in a local Firewise Community. Trainees practicing their new home ignition zone assessment skills at a home in a local Firewise Community. Jack Cohen (right) provides insight regarding home ignition hazards around a practice home. Big thanks to NFPA for inviting and flying us to Boise to share about our efforts and learn from experts in the field!